You might be wondering where your car tire pressure disappears to, a few hours after refilling yet you recently bought new tires. The truth is that there are many causes of tire pressure loss, most of which are subtle, such as temperature changes, a leaking tire valve steam or the tire getting an unnoticeable prick while on the road. An under-inflated car tire is a hazard on the road as it compromises functions such as traction and braking distance, affecting your control of the car when you face danger. It is also a liability since it wears faster and makes your car to work harder thus consuming more gas. In numbers, 10% under-inflation increases the tire’s wear rate by 5% and the gas consumption by 2%. Purchasing one of our reviewed portable tire inflators will maximize your car tire’s life and safety through regular refilling. You might also be having a leaking tire in the middle of nowhere and this air pump will save the day. 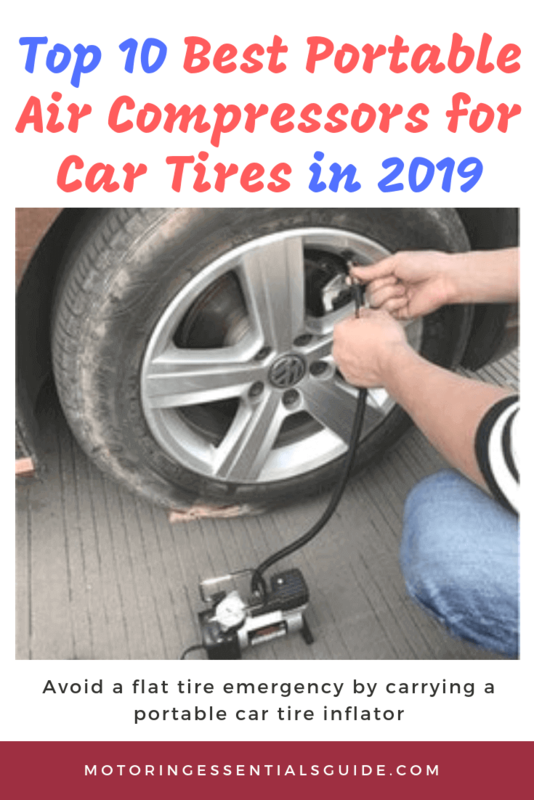 Without further ado, here’s our list of the best portable air pumps for car tires in 2019. Coming up after the review is a juicy operation and buyer’s guide for these portable air compressors. If you are one of those people who find it bothersome having to queue at the gas station just to get your tires inflated, then it’s time you joined the thousands of motorists enjoying the EPAuto portable and convenient car tire inflator. Imagine the convenience of charging your tires at home on a cool and rested car so that you leave and head straight to your port of call without taking detours? EPAuto portable air pump requires only 12V DC, 10-15 amps and plugs directly into your vehicle’s cigarette lighter socket. It is also a versatile inflator and besides your car, you can use it on bikes, and balls. Adaptors for balls and other inflatables are provided. It is easy and convenient to monitor pressure depending on the units you are comfortable with, as it features 4 units in digital display: PSI, BAR, KPA, KG/CM. It has a maximum working pressure of 100 PSI, more than enough for a family car and at 1.06 CFM, it will refill your car tires twice as fast as other run off the mill inflators. For safety purposes, you don’t have to worry about shutting it off when your set pressure is reached. It has an automatic shut off that lets you focus on another task as it pumps your car tires. The pump also features an automatic overheat protection shut off system that automatically switches the inflator off in case of an overload. You might also note that some little air is potentially lost as you detach the hose from the valve stem. To cater for this, EPAuto has designed the pump to charge a speck higher than the set pressure in order to offset the loss. You might experience a tire deflation at night and this digital tire inflator comes with an LED flashlight to illuminate the tire and the surrounding. There is no switch to turn off the LED light when it’s not needed. Our verdict: EPAuto emerged the best in our review due to its various protection systems, from overheat, over-inflation, and vibration, some of which most of the other portable air pumps lack. We also love the fact it is silent and versatile. It is, therefore, worth every cent from your pocket. You wouldn’t want to find yourself with deflated tires and a discharged electric car tire pump that won’t plug into standard DC outlets in your car. This pump plugs into any of your car’s 12VDC outlet and so it’s a plug and play device. Inflating your tires shouldn’t take ages because you have something worthwhile to do with your time and P.I. Auto Store- Premium pump is a new best in class inflator optimized for speed and efficiency. It has powerful 35l/min airflow, capable of charging a mid-sized car tire from zero to 30PSI in less than 3 minutes. Very few pumps can match this. The pump is also quiet and does not vibrate on the ground like a deadbeat generator. The convenience of use is also a major plus for this air machine for tires. You only need to plug it into the 12V cigarette lighter socket or any other 12V outlet. It is also easy to set pressure on the new LCD display pressure gauge that is backlit for you to see even in the dark. The air hose has a snap-on connector that is fast and easy to connect to and detach from the tire valve and it does not lose air during disconnection. At 13ft, the power cord lets you access all the tires without the need to change the power source. After use, there is a rear and a side compartment where you can wrap and hide the power cord and air hose, resulting in a compact pump that will snugly fit in your car trunk. The best portable air pumps for car tires works with a microprocessor tire pressure monitoring system that automatically stops at your set pressure thus avoiding over inflation and the need for your close eye. P. I. is the best all around air compressor and it supports, small cars, bicycles, motorbikes, SUV, RVs, and ATVs. It also pumps sports kit such as basketballs, and other inflatables. The good thing about this portable air pump is that it comes with adaptors for the different valves from bicycles, cars and sports kit. In case you want to conserve your car battery, you can get acquire an AC/DC converter for this inflator (sold separately) and charge it from your house supply. Finally, with this 12-volt tire inflator, you don’t have to worry a jot about satisfaction since it comes with 100% money back guarantee. Our verdict: This is a good pump that will help you keep your car tires in good health. It is compact, light and affordable. The only but is the fact that with time it can overshoot the set pressure by up to 2PSI. However, you just need to compensate for this when setting your pressure. You lose a lot by failing to regularly refill your car tire pressure, such as increased tire wear and tear, increased consumption of gas and the risk of accidents. VIAIR portable air compressors are one of the most sought after in the market and they help avoid this tire menace. VIAIR 85P is a miniature 12 volt portable electric tire pump that you can plug into any auxiliary power outlet in your car as long as it is rated 15 AMPS/12 Volts or more. If you hate weights, then this pump is relatively convenient since it only weighs 4.3 lbs. Operating this inflator is just a breeze. You only need to ensure that your car engine is running before screwing the air hose chuck to the tire valve stem. The best portable tire inflator comes with a mounted pressure gauge that you can use to monitor the tire pressure as it pumps. A super bright LED illuminates the gauge and the working area. At 1.26 CFM free flow at 0PSI, VIAIR has one of the most powerful air flows in the market and it can fill a 195/70R14 tire from flat to 30PSI in a record 2 minutes or less. If you are looking for a professional tire inflator with gauge that will get you back on the road in time for that meeting or escape from imminent harm, then look no further than VIAIR. The tire inflator for cars has a built-in heat sink that enables you to use it for longer without overheating. 3 ft of air hose and 10ft of power cord enable you to place the inflator at a central position where it will reach all wheels without the need to shift it. The digital air compressor pump for car tires has a continuous working time of 20 minutes at 30PSI, also one of the longest in the market. With the rocket speed pumping rate, you can fill all the car tires and spare time for other low-pressure inflatables such as balls. Unlike other air pumps, you don’t have to hold this inflator on the ground when pumping since it fitted with flexible rubber feet that help absorb vibration. There is no automatic shut off when the set pressure is reached. Our verdict: VIAIR is the most powerful pump in our review and it is worth every cent in terms of speed, efficiency, and reliability. The only major drawback with this air pump is that goes up to 60PSI, but this is not a concern if you are using it for mid-sized cars and SUV. At less than $50, Bon-Aire lets you own a single portable air pump that will refill all your inflatables, whether it is a road bike, UTV, truck, small car as well as sports equipment. The pump features an 18ft (1 ft rubber and 17 ft PVC) air hose and 6 ft power cable that save you the hassle of shifting it from one tire to the other. The inflator is primed by a 120 volt direct drive motor that you can plug into any 120V wall socket outlet. Your tire and inflatable refilling endeavor should not disturb your neighbors and to ensure this, the direct drive system has a whisper soft technology that produces incredibly silent and efficient operation. The pump is also fully versatile and it comes with adaptors for virtually any inflator available. Time is of essence even when you are recharging your car tires since there are situations when you might be obstructing traffic or in a risky place. This best 120v tire inflator can fill up a P185/R14 tire from 0 to 28 PSI in 2 and ½ minutes or less. It has a maximum working pressure of 150PSI and so it perfectly supports high-pressure inflation. An 18 feet air hose with a quick connector valve and a 6 ft power cable make it incredibly easy and convenient for all your car tires. Our verdict: What we love about Bon-Aire is its versatility and the high speed of pumping. The power cord and hose are also long enough to pump all tires from one position even if it’s the long Land Cruiser. Kensun is one of the most trusted brands in the automotive accessories industry and the AC/DC portable air pump for car tires transcends the swiftness of other air compressors by being adaptable to both AC and DC power sources. Kensun AC/DC is a portable inflator that comes to your service anytime, anywhere. It doesn’t matter what power source you have as it can plug into your home AC wall socket or any of your car DC outlet. It has two power cords, one for DC and the other for AC power. It also pumps any of your air filled item, from the heavy duty car tires to the delicate beach ball, and is adequately equipped to achieve the perfect pressure whether it is for indoor or outdoor use. It also comes with additional attachment nozzles (tires, basketballs and beach inflatable) to support the multipurpose use. Kensun tire inflator comes with a built-in analog pressure gauge that is accurate to +/- 1psi and a maximum reading of 120PSI. This pump features a 2.6ft black woven hose, a 3ft AC power cord and a 10ft DC power cord such that you don’t have to change the power source as you shift from one wheel to the other. It is also a compact design with a strong and convenient carry handle and a durable carry bag. Finally, it has a 30 minute continuous working time at 35PSI, twice the working time of most air compressors. If you are traveling out there, you can refill your car tires, the air mattress and beach ball, all at a go. Our verdict: What we like about Kensun is the fact that it is AC/DC adaptable and for refilling purposes, its longer working time is very convenient. Though the short cords and analog systems are a minus, its versatility, durability and affordability work in its favor and therefore it is worth a try. When it comes to safety when driving your car, after your brakes, properly inflated tires are your second most important devices. NOOX electric air pump for tires is what you need to maintain perpetual control while on the road. NOOX is a multifunctional digital tire inflator that features an LED light, a digital tire pressure gauge, tire pressure monitoring system, and automatic shutoff. The digital pressure gauge is calibrated in four units: PSI, KPA, and BAR, KG/CM thus enabling convenient pressure reading. The versatile and portable air pump automatically inflates your airbed, airboat, basketballs, air cushions, business and racing cars, SUV, truck, all types of bikes and vehicles up to 150PSI. The relevant adapters are always in the package. The microprocessor-based tire pressure monitoring and automatic shut off are one of the swiftest automatic systems and you don’t have to worry about over inflation. If you don’t like the annoying noise of a machine being hauled on the floor, then this inflator is your perfect companion. It is reinforced with soft PVC anti-slip mat that increases stability and absorbs vibration. If you have space limitations, again you need to go for NOOX since its compact triangular design will fit in a small space in your luggage bag, trunk, etc. Our verdict: This is a go-to car tire inflator for the many conveniences, including accuracy, ease of use and storage. It is also cute and can be a perfect gift for your boyfriend or girlfriend. Campbell Hausfeld opened doors in 1836 and it’s the quality of their products that has kept them in business ever since. The Campbell Hausfeld rechargeable cordless inflator doubles up as a power source that lets you complete your projects in case of a power outage. Campbell cordless air compressor reaches up to 230PSI and this lets you use one pump for charging your small car, truck, RV, UTV, boat rafts, bikes, and what have you. It comes with two standard inflation nozzles and one needle nozzle for sports balls. You might be camping or holding an event at a place with no or unreliable power supply and this inflator-charger unit will come to your rescue. It features a built-in power supply that can operate several 12 volt devices, helping you operate most of your electronics and finish your project wherever you are. If you dislike the countless cords that we have to carry in this modern life, cords, and cables that wrap together, tear or burn anytime, then Campbell cordless air inflator is for you. You only need to charge it from the standard wall outlet for 4 hours and it will serve you for the day. Onboard compartments for the hose and adaptors help you to keep the pump organized and neat. Our verdict: Out of experience, senior citizens know the good things out there and this is the air pump your parents and grandparents have been using for years. You can’t go wrong by investing in it as well. Deflated tires compromise your car traction and control on the road which can be potentially hazardous. The FamilyTool Automotive Portable Tire Inflator is a lightweight but powerful air pump that lets you recharge your tires on the go thus regaining control anytime. At 150PSI, FamilyTool portable air pump is powerful enough to charge your automotive, motorbike, truck, road bike, sports equipment, camping mattress and even pool inflatables. While at it, it doesn’t keep you waiting as it can inflate a mid-sized car tire from zero to 36 PSI in 4 minutes and from 30 to 35 PSI in less than a minute. The convenience of use is the obsession of this air compressor. It has a built-in power storage and so you can charge it at home for later use. To support the multipurpose use, it comes with 3 bonus nozzle adaptors (presta bike valve, low flow adaptor, and a sporting equipment needle adaptor). A built in LED flashlight lets you illuminate your working area if its dark and you can even flip a switch to activate a red emergency light. An automatic shut off system means that you can leave it to do its work and it will know when to stop. Finally, your satisfaction is guaranteed with 100% refund policy. Our verdict: At just $30 you get a powerful air compressor that will serve almost all your family pumping needs. We also love the fact that it is a battery powered tire inflator that you can charge and use while on the go. At 160PSI max, Black & Decker ASI300 portable air Station is a powerful inflator that meets almost all your household and while on the go pumping needs. Black & Decker lets you pump that air mattress for an impromptu guest rest, top up your bike for a long and worry free trail, or just tucking it in your trunk for an emergency leak. It can be powered from any electrical outlet and it has an automatic shutoff system that prevents over inflation. Its red-faced illuminated gauge is perfect for night time reading. Storage space is always a problem when you are traveling and this automatic tire inflator has a small but compact design that hides at a corner of your car, truck, or watercraft trunk. The convenience of refilling your tires, rafts, tubes or towable in an emergency is reliving. It also comes with standard, needle and extension nozzles to support all your pumping needs. Finally, you enjoy a 2-year limited warranty, in case you are not satisfied with the product. Our verdict: Black and Decker have one of the most powerful tools at an at-par cost with others and this is still the case with this pump. Though some people find the 6.1 lbs weight to be heavy, you will love the low and high-pressure reliability. Your car might get pricked and start leaking along the way, so how do you make it to the tire store or the mechanic? You carry a Husky Tools tire inflator in the trunk and refill until you reach assistance. With a height of 6.9 inches, this is a pocket-sized and compact car air compressor that almost disappears into a corner of your trunk. It has a maximum working pressure of 130PSI and it quickly inflates not only your car tires, but your air mattresses, bike tires, and sports balls as well. It is equipped with mattress nozzle, a needle nozzle for sports balls and a presta valve adapter. With Husky 12V inflator you enjoy a silent pumping, not like the vibration and noise of other portable pumps. Even if your car tire goes empty on a dark road, the glow-in-the-dark pressure gauge will ensure that you get accurate pressure readings. We also like the clip-on nozzle that it easy to fix and does not lose as much air as other nozzle designs when detaching. Our verdict: Husky is a small and super quiet air pump. However, compared to other brands reviewed, it takes more time to charge an inflatable from flat to maximum. We would, therefore, recommend it for refilling purposes only. Operating a portable tire inflator for charging your car tires or any other inflator only needs you to follow a few easy-peasy steps that even your granny will get around. Place the portable air compressor on a flat surface on your driveway or any other roadway where you might be. If it’s dark, turn on the LED flashlight to illuminate the inflator and your work area. You might also want to switch on the emergency light if you are causing any obstruction. Ensure that the pumps’ power switch is off and your car’s engine is running. When the engine is off, the vehicle’s battery falls a shade below 12V and this will compromise the inflator’s voltage and current requirements. A cordless tire inflator lets you avoid this step. Detach the dust cap covering the first tire valve and then attach or screw the air hose chuck onto the tire’s valve stem. If you are using a cordless battery charged air pump then go to step 6. If not, plug the pump’s power cord into a 12V cigarette lighter socket or any other 12V outlet. Ensure that the outlet’s current rating matches that of the inflator. Turn on the pressure display unit, select your desired display units, and set the desired pressure by pressing the (+) or (-) button. Wait for the display to stop flashing. Turn on the compressor power switch and leave it to pump to your desired pressure. A pump with automatic shutoff will automatically shut off when the set pressure is reached. If it doesn’t have the system, then you should turn off the power when the pressure is a fraction above the set pressure to compensate for the loss when detaching. Turn off the power source. Unscrew or detach the valve connector, replace the dust cap onto the tire valve and disconnect the power cord from the socket. The word pump is often times substituted for compressor, but there exists a difference when it comes to comparing with standard pumps. The ordinary pump lifts a fluid from one point to another without affecting its pressure. An inflating pump or compressor on the other hand, is a machine that besides lifting a gas from one point to another, it squeezes it so that it’s delivered at a much higher pressure than it was. With this, the compressed gas can be used to inflate things like tires, balls, boats and so on. Though it may need more power than an equivalents standard pump, being portable, means that the compressor has optimized features so that a small mobile size can serve your needs. When it comes to selecting the best portable air pump for your car tire without prior experience, it’s easy to get lost in the specifications, ratings, dimensions, and all. However, with proper guidance, you will know what to look out for and you’ll soon realize that you don’t have to be a techie to separate wheat from chaff. Different pumps are designed to use different power sources and you would want the most convenient for you. There are those that plug into the household AC power outlet and they may or may not have battery storage. Such a type makes the best air compressor for home garage. They also make the battery charger and air compressor combo such as the Campbell Hausfield cordless inflator. The second type is the inflators that directly plug into your car’s battery. They come with crocodile clips and they make the best portable air compressor for off road use where there might be no 12 volt outlet, such as the RVs. The third type is the air pump that you can simply plug into car’s 12V outlet. These tend to be lightweight and compact and most of them are as efficient as the heavy-duty AC or battery powered air compressors. We found this type to be the most convenient due to its easy while on the go use. The fourth type is the hybrid, a car tire air pump adapted to both AC and DC power. These are equally if not more convenient than the 12V tire inflators. A highly accurate gauge will enable you to inflate your tires and other inflatables to the precise pressure you desire. It also enables precise automatic or manual shutoff when the set pressure is reached. However, an ideal gauge is unachievable at a consumer friendly price and from our tests we concluded that a margin of error of + or -1PSI should be acceptable since it is easy to compensate when setting the pressure and detaching the valve connector. When it comes to analog gauges, legibility is very important so that you can know exactly when to stop. It is therefore important to check the size and scale of the gauge. For instance, a 1 inch gauge going up to 300PSI may not even have 5 or 10 PSI pressure increments and therefore realizing say, 33 PSI is simply guesswork. Digital pressure display is always the easiest to read and it would be better if it has a digital readout. Every minute is precious in your busy life and the last thing you would want is a car tire inflator that takes an hour of your time. There are powerful pumps that take 2 minutes or less to charge a mid-sized car tire from flat to 35 PSI while others will take more than 10 minutes to do the same. It is important to ensure that the pump’s CFM (cubic feet per minute) is 0.5 or higher but you should confirm the inflation time before purchasing. Portability is determined by the inflator weight, size, and presence of a carry handle and/or carry case. The heavier and bigger the air pump is, the more it will burden your car and take up more space in the trunk. Most of our reviewed pumps were below 5 lbs and in fact, some of the lightest ones at 2 lbs were the best performing. You don’t want your neighbors to get infuriated thinking you’ve recently set up a milling machine at home and it’s therefore important to go for a vibration resistant air pump. The best ones are fitted with study rubber feet for stability and absorbing vibration. Due to factors like heat buildup, a pump is an intermittent machine and you would want something that will inflate all the four tires at a go. Most pumps have a continuous working time of 10-15 minutes and this might need you to restart it especially if have a completely empty tire. A good number of pumps in our review had a duty cycle of 20-30 minutes. You would prefer not to have to carry the air compressor from one tire to the other. The only way to ensure this is having enough power cord and air hose. Bon-Aire had the longest air hose of 18ft while the P. I. Auto store had the longest power cord of 13 ft. Some pumps have a long enough per cord but a short air hose such that you have shift the pump but not the power source. However, cable and air hose length is a secondary issue that should not prevail over performance. The power cord and air hose should also not be too long as this will cause current and pressure loses respectively. It also creates a storage problem.